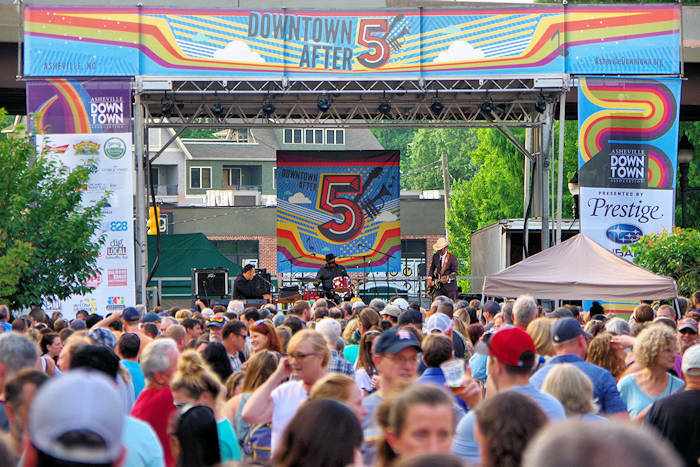 Downtown After Five provides free live outdoor music concerts in downtown Asheville every third Friday 5-9 PM from May through September. They celebrate their 31st year in 2019. 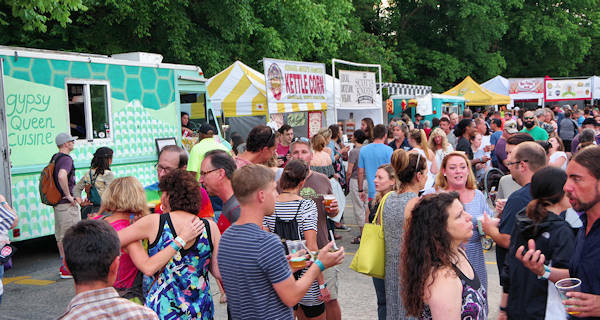 Thousands gather on North Lexington Avenue near the I-240 overpass to enjoy local and national beers and a variety of food vendors. While admission is free, you must buy a $2 wristband to purchase beer, hard cider and wine. Lots of local beers and hard ciders on tap from Pisgah Brewing, Sierra Nevada, Hi-Wire Brewing, Asheville Brewing Company, Catawba Brewing, French Broad Brewing, Green Man Brewery and Bold Rock Cider, as well as beers from Western North Carolina and regional and national brands. Wine, soda and water also available for purchase. Food vendors and trucks include D.O.G.S., Gypsy Queen Cuisine, Kernel Mike's Kettle Corn, Moe's Original BBQ, The Grubbery Food Truck and Sunshine Sammies. No pets or bikes allowed. Bring your chair, but no coolers or tents. 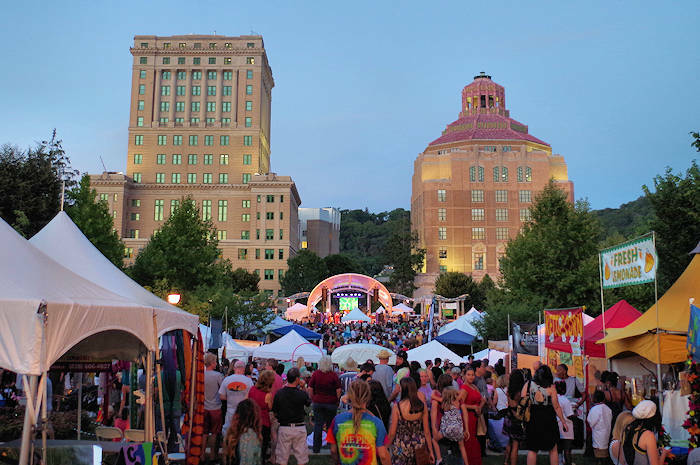 The Asheville Downtown Association partners with five local nonprofits to sell wristbands at the event, giving each a $2,000 grant. June 21: Austin native, Tameca Jones’ powerful vocals fill the air. Her debut single, Hot and Bothered, has an old-school Motown vibe that makes the singer’s vocals shine bright. She was crowned best female vocalist at the 2018 Austin Music Awards. Support: Secret B-Sides with a fresh sound, rooted in the classic feel of R&B and soul music, updated with the modern sensibilities of hip hop. July 19: Shamarr Allen (of Galactic and The Underdawgs) is the definition of New Orleans. Allen’s influences range from jazz and hip hop to rock and funk. Allen was the longtime trumpet player for Galactic and has collaborated with Willie Nelson, Patti LaBelle, Harry Connick Jr and Lenny Kravitz. Support: April B. & the Cool, drawing style and inspiration from Hip-Hop, Soul, R&B, Funk, Rock, Jazz and Reggae music in sultry and alluring fashion. Opener: Natural Born Leaders is a lively bite of hip-hop-gumbo-funk with strong, musical burst of soul. August 16: The Artisanals’ blend of heartland 70s rock and alt-Americana couple with influences like Bruce Springsteen, My Morning Jacket and The Cars. Support: The National Reserve marry R&B, funk workouts, late night soul, and bluesy rock ‘n’ roll. Opener: Emma’s Lounge morphs from rootsy folk to rollicking rock and powerful soul, to electronic-tinged psychedelic funkiness. September 20: Asheville All Stars has quickly become a favorite of the season, featuring some of AVL’s best musicians making music together. Opener: Asheville Rock Academy gives young musicians the opportunity to meet and play together while learning from professional musicians. Just a few blocks away is the Friday night Drum Circle. 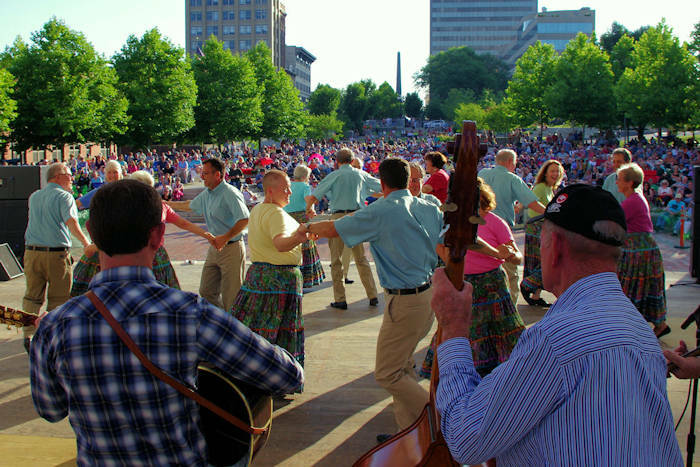 See more things to do in Downtown Asheville.